Have you been hearing the blogosphere buzz about #Write31Days and wondering why in the world you’d want to publish a post every day during the month of October? Here are 13 reasons why you’d want to write a 31 Days series. 1. As a service to your readers. Your 31 Days series should be on a topic that will serve your readers. Answer their questions. Talk about their favorite topic. Give them that series they’ve been asking for. It’s a gift that will keep on giving–for them and for you. There’s nothing like a 31 Days series to test your blogging strength and endurance. Make #Write31Days a personal challenge; and make each post better than the day before. The accountability of having promised your readers (and yourself) a post every day of the month will keep you writing when you’re ready to throw in the towel. 4. Because everyone else is doing it. Looking for the motivation of group accountability? With over 1,200 people participating, this is the ultimate positive peer pressure. If you don’t already know another blogger participating, invite some friends or challenge your mastermind group to join you. 31 Days is a great networking opportunity. You’ll be busy writing and maintaining your own 31 Days series, but don’t neglect to find, follow, and share at least a few other 31 Days series. Increased traffic shouldn’t be the only reason you’re joining #Write31Days–or doing anything on your blog. That being said, it is an amazing opportunity for greater exposure for your blog in the ever-growing #Write31Days community. 7. Establish authority on a topic. #Write31Days is a great chance to become known as the go-to resource on any given topic. Explore your favorite aspects of a topic you’re knowledgeable about and you’ll establish authority on the subject. 8. Learn more about a topic. Have something you want to learn more about? Explore it for 31 Days! Just make sure you’re sharing what you learn in a way that’s honest about the fact you’re a student of the subject rather than accidentally claiming to be a pro. 9. Test out a book idea. Many a 31 Days series has since become an eBook. This is a great chance to test an eBook idea and get instant reaction from your audience. Fiction more your style? Use #Write31Days to share 31 character sketches or introduce readers to your writing by sharing a short story in 31 parts. 10. It’s great for SEO. If you pack your #Write31Days series full of content that’s timeless or “evergreen”, your series landing page will be a great source of SEO for your site now and in the future. You can even add a bullet list of posts you’ve already written on the subject in case people are looking for more. While it’s wise to write at least a few of your #Write31Days posts ahead of time, you can also use October as an opportunity to create a consistent habit of writing each day. You’ll have a great sense of accomplishment when October is done, but it will grow as you continue to see the fruit of your evergreen 31 Days series in future years. 13. Earn the right to a break. Writing 31 posts in October gives every blogger the opportunity to ease up on their posting schedule for the holiday season. Unless, of course, you’ve created such a habit of consistent blogging that you can’t stop. Blogging Link-Ups: great for authors & bloggers! 31 days series: will you or won’t you? Overwhelmed? That’s okay. 31 Days isn’t for everyone. 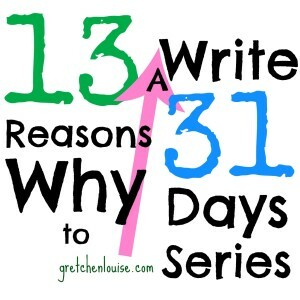 I’m sure we could come up with 13 reasons why not to write a #Write31Days series, too! Why (or why not) are you writing a 31 Days series? Tell us in the comments! I am trying to find ways to link up and stretch my writing. It is something I thoroughly enjoy and is a skill I want to improve. I stumbled upon the 31 days a bit late though, is it too late? Or should I put it on my October 2014 calendar? I don’t think it is too late! Start now and go through mid-November. The goal is to write for 31 days–they don’t all have to be in October. Great post! I came over from The Nester herself. I’m participating for the first time this year for most of the reasons you’ve mentioned. I have a new life coaching business and 31 Days of Radical Self-Care is my topic. I’m hoping that the discipline of planning and writing this series is good for me, and that it will be a huge value to my readers and clients I’m also hoping to use it for networking and marketing and potential ebook and/or workshop fodder. Your ideas are right on. Thanks for this list of 13! I’ve been wanting to participate in the 31 Day Challenge for at least 2 years but somehow it has always snuck up on me and I was never prepared. I guess last year I had a 2 month old..that’s not very sneaky but a good excuse at least! Now, I’ve had a year to brainstorm and I’m just getting stuck. Anyways, I’m praying about it. Thanks for the encouragement! Hope you get un-stuck in your brainstorming soon. Everything finally clicked for me earlier this week and now I have half my series in rough drafts. Lots more work to do, though! Love these 13, Gretchen, and I love 31 days! Last year was my first foray, and the challenge was fun and a bit stretching, connecting with all kinds of bloggers surely enlarged my borders, and my own blog took wings. If you’re not sure about this, go for it anyway! I love your description of what 31 Days did for you and your blog, Linda! Thanks for sharing. My problem is coming up with a topic. I feel the pressure to come up with something I’ll want to talk about and readers would want to read about for 31 days as well as a catchy title that would make a great button. I am confident that if He wants you to do it, He will give you the right idea. 🙂 Maybe He has something else in mind for your blog this October…or maybe He wants to stretch you as you try out 31 Days. 🙂 Looking forward to seeing what He does in and through you!